There are many factors that go into picking the perfect dress for your big day. It could be long sleeve or off the shoulder and don’t even get me started on the number of different shades of white your dress can come in. But it’s the back of the dress that is one of the most important parts of the dress that many brides forget about. After all, it’s what guests see throughout the ceremony so, of course, the bride-to-be will want to look back (pun intended) at wedding photos and reminisce about how good she looked at every purpose. From modest low backs to dramatic with interesting detailing, below we’ve highlighted just some of the most stunning wedding dress backs by top designers that are sure to turn some heads. Tradition meets modern romance in the backs of these elegant gowns by the British designer. Oh-so-chic, the backs of these frocks feature the most beautiful embroidery and button detailing that leaves us speechless. A structured ensemble with graphic detailing is the perfect way to accentuate your back on the day you say ‘I do’. For an alluring back with a twist of modernity and elegance, look no further than Olvi’s. Leave it to this French designer to capture romance and cool-girl vibes in the backs of these gorgeous dresses. Who wouldn’t say ‘yes’? Tie-the-knot with a bow and seal with love. We hope you will be as obsessed with these backs as we are! 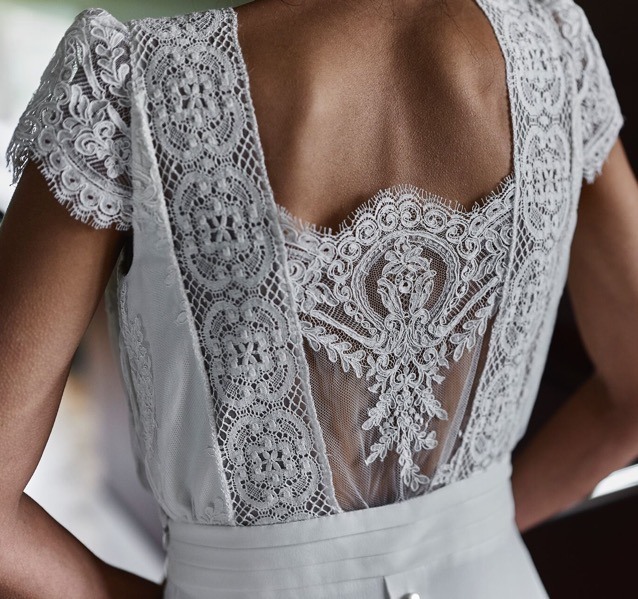 We love the detailing on the backs of these romantic and enchanting wedding dresses by Wtoo. The bold lace and intricate details in back of these free-spirited gowns are sure to captivate the attention of wedding guests.